In a 15-minute speech, Obama paid tribute to what he said was a hefty American sacrifice which now allows Iraq to determine its own future. “Because of our troops and civilians and because of the resilience of the Iraqi people, Iraq has the opportunity to embrace a new destiny, even though many challenges remain,” Obama said. “We have closed and transferred to the Iraqis hundreds of bases and we have moved millions of pieces of equipment out of Iraq. This completes a transition to Iraqi responsibility for their own security. US troops pulled out of Iraq last summer and Iraqi forces have moved into the lead with considerable skill and commitment to their fellow citizens…. This was my pledge to the American people as a candidate for this office,” Obama said. “Going forward, a transitional force of US troops will remain in Iraq with a different mission: advising and assisting Iraq’s security forces, supporting Iraqi troops in targeted counterterrorism missions and protecting our civilians. Consistent with our agreement with the Iraqi government, all US troops will leave by the end of next year,” he added. 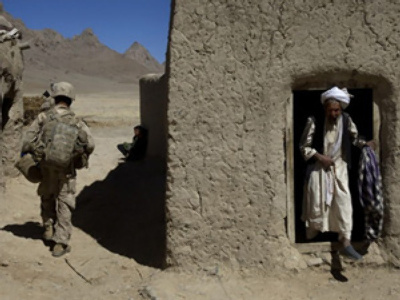 Obama moved on to note that Afghanistan will now receive new resources, with intensified operations against Al Qaeda leaders. However, he stated that the operation in Afghanistan would not be an "open-ended war," with withdrawal to follow there as well. Obama ended his speech by turning to the faltering American economy, and the vital need for recovery. Alison Weir, director of the US Council for National Interest, thinks Obama’s speech was successful in conveying a strong sense of patriotism and leadership. Paul Craig Roberts, a former Reagan administration official, referred to Obama’s speech as double speak, arguing that he was saying what he had to to satisfy both the political right and his supporters. He argued that with about 50,000 US troops and now possibly 200,000 private contractors in Iraq, the operation has merely changed from soldiers to private mercenaries. In his speech Obama mentioned troop casualties, but neglected to mention Iraqi sacrifices and civilian casualties. “If he talked about those then he couldn’t call that a commitment to Iraq. How is it a commitment to Iraq to destroy the country,” said Roberts.